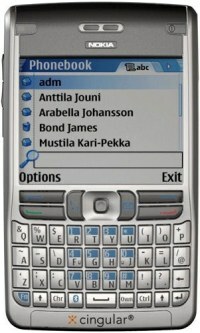 Nokia E62 is a Smartphone similar to BlackBerry, Treo and Motorola Q, and available on Cingular service. Nokia E62 features Symbian OS 9.1, S60 3.0, GPRS/EGPRS support, EDGE support, GSM 850/900/1800/1900 MHz, Bluetooth 2.0, miniUSB port, 320×240 16 million colors TFT LCD, push email support (i.e. Good Mobile Messaging, BlackBerry Connect, Intellisync Wireless Email, Mail for Exchange (Microsoft ActiveSync) and Xpress Mail), QuickOffice for viewing or editing Word, Excel or PowerPoint files, instant messaging client, full QWERTY messaging keyboard, USB Mass Storage Mode (as portable disk), integrated handsfree speakerphone, Screen Export feature which allows PowerPoint presentations with compatible projectors, positioning and navigation Bluetooth GPS devices support, and various productivity software. CrunchGear meanwhile concludes that if you’re on Cingular and you need a touchscreen with true mobile broadband then you might want to wait until the 8525 (HTC Hermes) goes retail (soon). If can’t wait for the 8525 with its HSDPA enlightenment, then the Nokia E62 is undoubtedly the way to go. The E62 is available now for $149.99 with a two year contract and the BH-800 Bluetooth headset can be had for about $120.